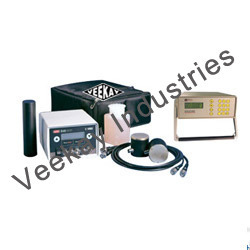 Pioneers in the industry, we offer ultrasonic pulse velocity tester from India. This Ultrasonic Pulse Velocity Tester provided by us, is used for the purpose of determining time interval between the starting of a pulse generated at the transmitting transducer and its arrival at the receiving transducer. Manufactured in compliance with international standards, the standard of this product is always maintained. The raw materials used in its manufacturing, makes this product quite strong and durable and in turn making it highly demanded. B.pulse Repetition Rate Select: 3 Prr & 10 Prr. Operating Temperature Range: 0 to 50 °c. Temperature Range: 0 to 50 °c. Looking for Ultrasonic Pulse Velocity Tester ?